Let’s face it, multiple monitor support on the Mac has been painful. That’s set to finally be cured in OS X Mavericks, but in the meantime (or if you have no plans to upgrade to Mavericks), Aaron Ng’s Multimon 2.51 (Mac App Store link) eases the pain. Multimon adds a menu bar to your external displays, so you don’t have to drag your cursor across multiple displays just to operate your apps. While Multimon’s main function just works—even across multiple monitors and desktops—Multimon also enables you to move windows between displays with a keystroke. 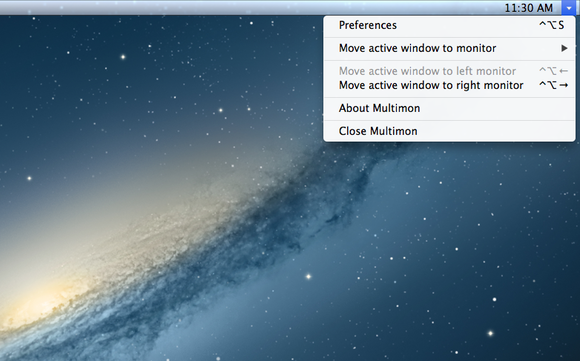 Just press Control-Option and then an arrow key to move the active window to another monitor. Best of all, Multimon remembers your window positions, so if you unplug an external monitor from a MacBook, then plug it back in, all your windows return to the same position, instead of winding up a jumbled mess. If you work with multiple monitors, Multimon is a must-have. Get the multiple-monitor support your Mac deserves—now.